Lansbrook Golf Club offers a great challenge, great conditions and service. Established in 1975 and located in Tampa's North Pinellas. Lansbrook's greens are Tifdwarf Bermuda and are in excellent condition. Lansbrook prides itself on constant improvements. Recently, the clubhouse was renovated, a new irrigation system was installed and greens #10 and #14 were rebuilt. Water come into play on many of the holes but do not worry, there are four sets of tees to accommodate players. There are no parallel holes at Lansbrook and many are nestled within forest areas. 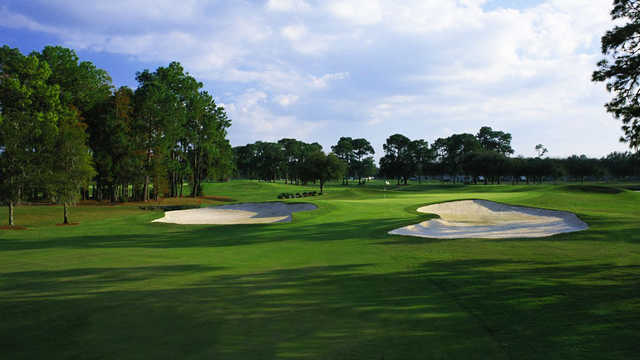 Hole #11 is a replica of the famous 26th at Augusta North Golf Club. Lansbrook is challenging for the good player and fun to average or beginning golfers. Friendly courteous staff, a complete practice facility (including driving range), chipping and putting green, bag pickup at your car, are all great reasons to make your next tee time at Lansbrook Golf Club.